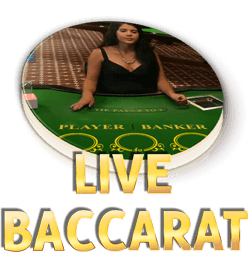 Live Dealer Baccarat is a game that has always appealed to high rollers, and it is one of the first games to be offered in live dealer casinos. With only three simple bets of which you will use mostly two, this is also one of the simplest card games there are. The game does require certain skills however in order to beat the banker. Throughout the years since live dealer games appeared, software developers have adjusted other baccarat variations too for live play, so you can expect to find an interesting choice of live baccarat games. Live dealer games like baccarat are perfect for people that get easily bored of playing against a computer, but still want to play online and to get a true casino atmosphere in the process. These games fit in that picture perfectly. What’s even better is that the size of the wagers in live dealer baccarat is not much different from those allowed in standard baccarat. In fact, you will notice that live casinos offer a variety of baccarat tables with limits that fit both high rollers and regular players. 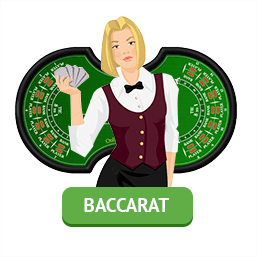 Live dealer baccarat games offer a very authentic atmosphere and a genuine feel like in a real casino. You don’t have to travel far and don’t have to dress up for the occasion. You can even collect various bonuses that online casinos give to players to play live baccarat. Unlike other games, live baccarat offers a house edge that is considered one of the lowest alongside blackjack. If you bet in on the banker, the edge is just 1.06%, and only 1.24% for betting on the player. The tie bet has the highest edge of 14%. With the development of the mobile gambling technology, now live baccarat can be played on any decent Smartphone or tablet. Not all online casinos offer mobile live dealer baccarat, but those that do are growing in number each day by adjusting their games for mobile play. Playing live dealer baccarat is just as playing non-live baccarat game at any online casino. The game play is the same, the rules are the same, but you are faced with a dealer that is broadcasted live from a studio seated at a real baccarat table with real playing cards. You just need to place a bet by clicking on the chips and wait for the cards to be dealt. There are also live baccarat tables where more than one player can play against the dealer simultaneously. In such games the dealer usually plays the same hand with all players. In order to play a live baccarat game, you first need to find an online casino with a live casino section where all the live dealer games can be found. These live casinos run on the same platform used for the other games. So in order to gain access to the live dealer games, the standard thing to do is to download the software of the casino from which you can access the live dealer section. The same thing can be done through the website. Anyway, either way offers convenience, but previously you will need to register as a member of the casino. When you try to launch the live casino it may pop up in a separate window. First you will gain access to the live dealer lobby, where you can choose the game that you wanted to play. The lobby will show you how many players are seated at a particular table, and what the table limits are. When you have selected a table, just click on an available spot at the table to be seated, and the game will start. Playing a live baccarat game is completely identical to playing a standard baccarat game against the computer. The difference is the live feed picture of the dealer and the table. The interface is pretty standard too, you have the banker and dealer bet sections, the deal button, draw button, rebet etc. As most table or card games, baccarat too has suffered some changes, which later helped produce several different variations of the game. These variations have been successfully implemented in live casinos as live baccarat games and now you can find them at many live casinos. Popular baccarat variations are mini baccarat, in-running baccarat, progressive baccarat, baccarat pairs or lucky pairs, dragon bonus baccarat, zero commission baccarat, super 6 baccarat, premium baccarat etc. Naturally, the most popular of these is probably the progressive baccarat variation, because of the chance to play for a progressive jackpot. Other popular variation among these is the dragon bonus baccarat, where the side bet can be won with eight different hand combinations. Each of the above mentioned variations have their own unique side bets, based on one or more hand combinations with different payouts. One of these is the Pairs side bet, with which you bet that either the banker or the dealer will receive a pair. You can also bet that both of them will have pairs, or you can bet that one of them will receive a suited pair, which is called Perfect and is paid 25 to 1. By playing each of the variations you will easily learn the side bets too and their rules. Their purpose is to give the player an extra chance of increasing his potential payout, but if not played carefully, they can be very costly for players. Standard bet limits are used in live baccarat games, you will find the standard minimums bet amounts of $1 or $5, which can sometimes go down to $0.50, but rarely. The maximum bet limits usually range from $100 to $25,000, but commonly $500, $1,000, $2,500 or $5,000 limits are applied. One of the great things in playing online baccarat is that you can take notes of the results of every hand played in order to be able to keep an eye on whether to bet on the banker or the player. Actually, taking notes is allowed at baccarat tables in land-based casinos too. The basic purpose of this strategy is to bet the opposite of what the notes show you that you have taken. If the banker has a streak of 3 winning hands in a row it is more likely that the next hand will be a winning hand for the player, so therefore the logical thing to do would be placing a bet on the player’s hand. If only two of the three past hands were won by the banker, you should bet on the player too. Betting on the banker with a streak of only two previously won hands is a bit riskier. Try this strategy and practice it a little. When you’ve learned how to play it and got the hang of it, you can start spreading your bets better. This means that if the banker had 3 winning hands, and you anticipate that the next one will be a player winning hand, you have to increase your bet amount, and decrease it in situations where you are less likely to guess the outcome. The point is to profit more when you are confident about the result, thus maximize profit.